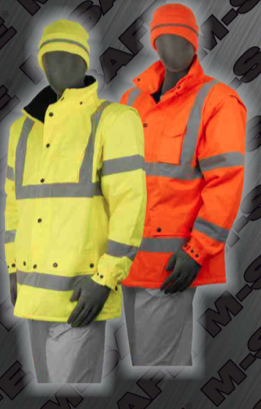 Looking to buy safety parkas in Rochester NY, Ithaca NY, and Western NY at competitive prices & with exceptional service? The Duke Company proudly carries the finest Safety Parkas – ANSI 107-2010 Class 3 Parka in High Visibility Yellow and High Visibility Orange. Offers exceptional cold weather, high visibility. Renown for keeping out the wet and cold. Polar fleece lining is anti-pilling and sewn in. Exceptional details including taped seems. Sleeves are fully detachable and noted features include elastic cuffs and powerful snaps for wind protection and storm flap. Meets rigorous ANSI / ISEA 107-2004 Class 3 standards. Heavy duty zipper for long wear life.